No. 2, Jalan PJS 11/16,Bandar Sunway, 46150 Petaling Jaya, Selangor, Malaysia. 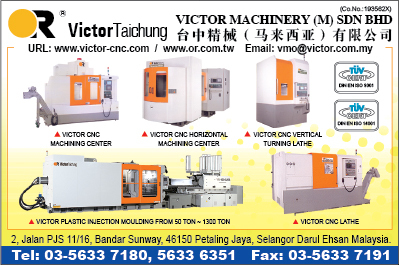 Victor Taichung Machinery, founded in 1954, specializes in a wide selection of machining centers, including CNC machining center, vertical machining center and horizontal machining center. Insisting on technology innovation and quality superiority, Victor Taichung's engineering staff conducts research and development in new areas of technology in machining centers, as well as ongoing improvement programs for current products. Today, Victor has eight technical support and distribution centers located in USA, England, France, Germany, South Africa, Malaysia, Thailand and China. We wish you to enjoy browsing our website, and find the machine center what you want.